Happy Saturday Lovelies! I am very much enjoying my time here in DC with Posh Politico, but I have to admit being stylish in the coldest of climates can be quite a challenge (even for the most fashionable). I'm always looking for something to jazz up the oh-so-boring coat, scarf and gloves combination. Luckily, I have found my favorite new accessory. 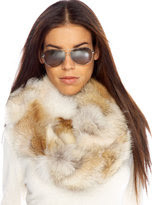 I purchased a fur infinity scarf very similar to today's featured essential a few months ago and have yet to take it off. It is truly the perfect cold weather accessory. I have paired mine with everything from a sweater, leggings and flat boots to cocktail attire. It truly adds something special to every ensemble. Another fashion mystery solved! Bring on the Spring - Rainbow Bright! Casual Date night with the Hubby! Golden Globes - What will they wear? Breaking Fashion News - First date!